Material from Mike Mignola’s supernatural adventure series Hellboy, previously released as ‘floppy’ comic books and later as paperback reprint collections by Dark Horse Books is presented in the Hellboy Library Editions in oversized archival volumes with heavy paper and cloth hardcovers. 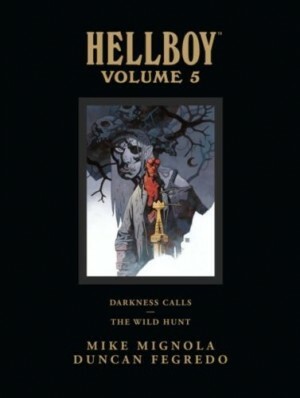 Each volume reprints two complete trade paperback collections and supplements the complete stories with pages of annotations and commentary, sketches and other additional behind-the-scenes material by Mignola, some of which is exclusive to these volumes. At a very reasonable price point for such a well-designed collection of four hundred pages of large-format colour art, these Library Editions are the definitive way to enjoy the series and present extremely good value for dedicated Hellboy fans. 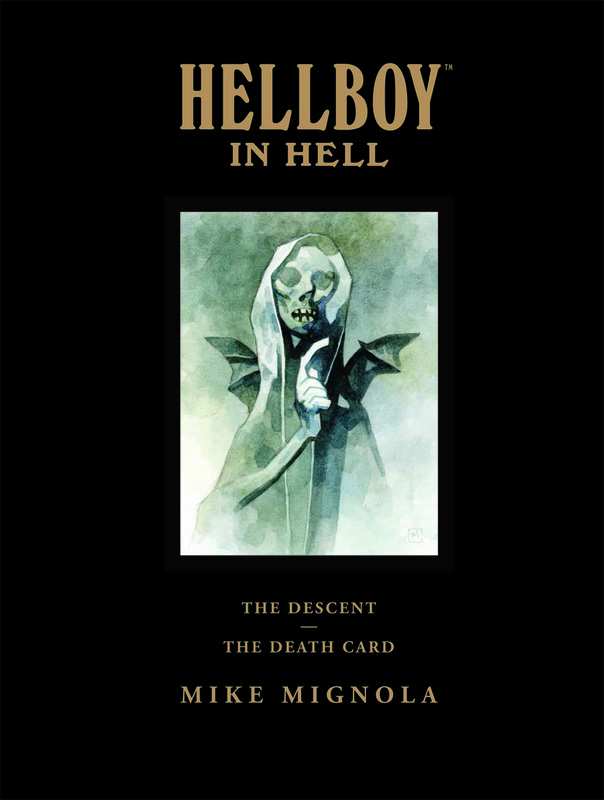 This is the seventh Library Edition, presenting the entirety of the final Hellboy series Hellboy in Hell, over two books The Descent and The Death Card. 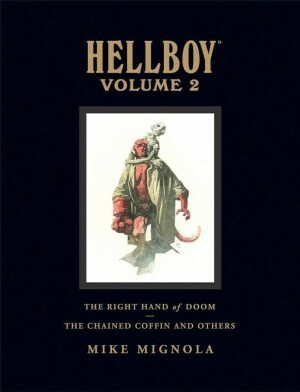 Mignola always maintained that he intended Hellboy in Hell to be an ongoing series with no fixed endpoint as in the previous incarnation of Hellboy, but just a short way into exploring this new setting (the eighth story in this book) he realised he had written himself to a natural resolution. He decided to follow that thread to its conclusion, ending the series shortly after. 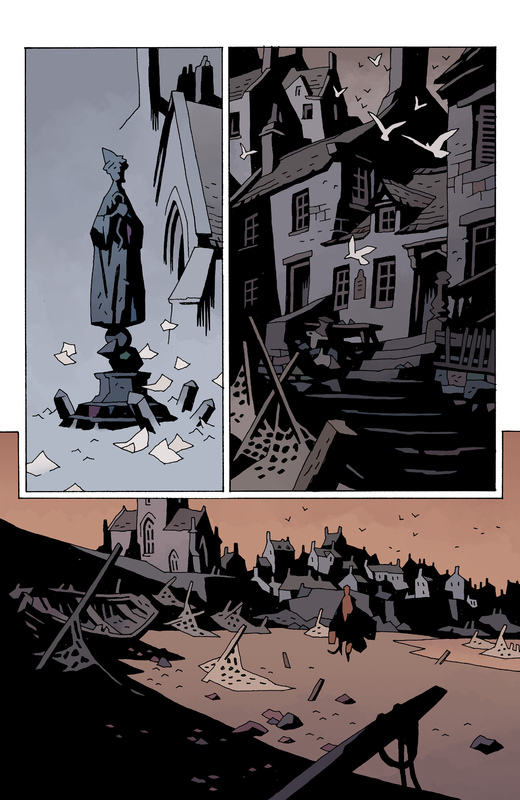 In the ten stories presented here Mike Mignola pushes his drawing language to drastic levels of minimalism with almost diagrammatic images anchored by his complex compositions and strong, strange colours from Dave Stewart. They deliver poetic and memorably odd scenes, leading to an excellently appropriate, mythic ending for this saga. 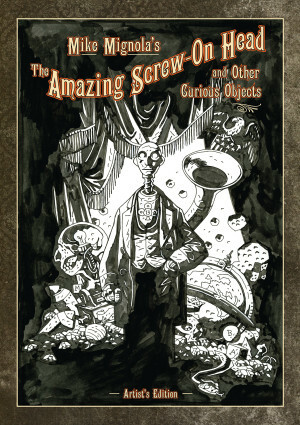 A very nice touch to this collection is an epilogue in the form of the short story ‘The Magician and the Snake’ (previously collected in The Amazing Screw-On Head and Other Curious Objects) referenced at the very end of Hellboy’s journey in this series. It doesn’t give any extra clues about how to interpret those final pages but everything the reader needs to come to their own conclusions is right here. Hellboy ends on a unique and very fitting high point with this volume and longtime fans will be completely satisfied. 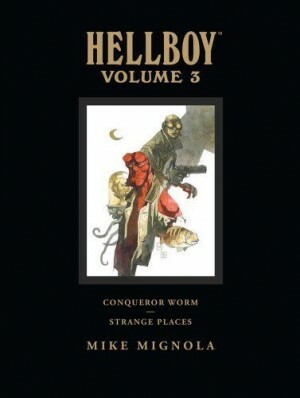 There is also an Artist’s Edition available of the first five stories from this volume, Mike Mignola’s Hellboy Artist’s Edition (Hellboy In Hell and Other Stories) which presents the original 113 black and white art pages created by Mignola for Hellboy in Hell Volume 1: The Descent, including cover art, back covers and variant covers, plus 63 pages of art from earlier Hellboy stories.